This article is designed to help you make that decision. 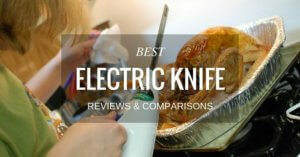 We have researched several of the best electric knives on the market, weighed the pros and cons, read the consumer reviews and come up with what we feel are the best contenders from which you can choose. 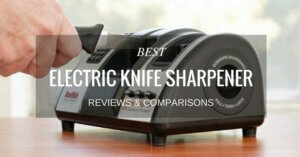 By the end of this article, you will see our pick for the top rated electric knife and why we chose it. An electric knife can truly speed up the carving process, whether you are carving meat, filleting fish, or slicing bread. These are some of the most basic considerations but we also urge you to keep in mind other things such as the portability of the knife; are you going to use it strictly in the home environment? If so, then a knife with an electric cord may be sufficient. But what if you like to camp, or fish? 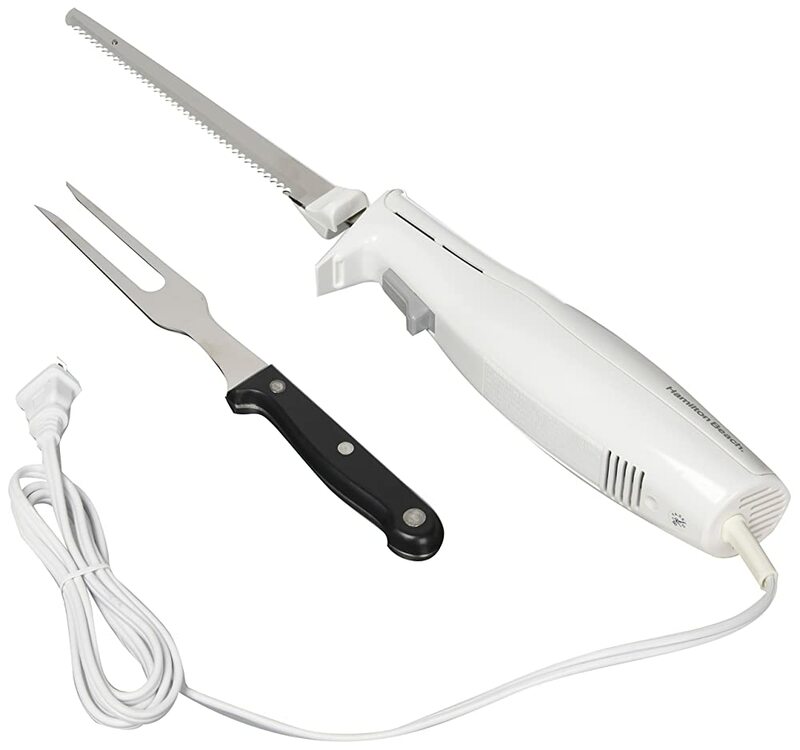 Do you see yourself needing to have a more portable model of the electric knife? Not all hands are created equal and some of the handles on knives, whether ergonomically designed or not, may be too big, or too small, for your hands. A decent warranty is still a big seller for many when it comes to deciding whether or not to purchase any product, and it should be one of the things you think about when deciding which type of electric knife to buy. If you are going to be using your knife frequently then you need to consider power and durability. If you are cooking for large crowds, whether at a restaurant, outdoor camp, or similar setting, or if you are an avid fisherman, you want to know that your chosen knife will be dependable. Last but never least, the price is always a consideration when buying anything. For some people, knowing they are getting the best deal for their money is huge; for others, buying the cheapest is a matter of dollars available. But inexpensive does not have to mean cheap quality. We have taken all of these thoughts into our consideration when making the decision regarding what we see as the top 5 contenders for the best electric knife. 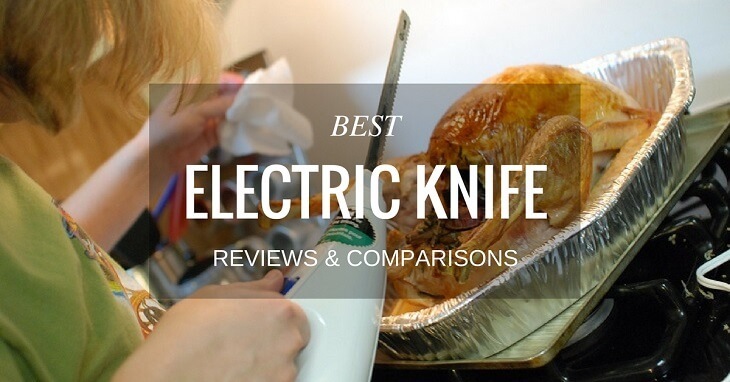 Of course, we also read many of the electric knife reviews from consumers, both the good and the bad, who have bought and used one or more of these knives. Here is a quick overview of each of the electric knives we have chosen to present and compare. The considerations regarding each are expanded upon in the section below. It is always wise to first do some research before making any kind of purchase, and it holds true for something like an electric carving knife. To save you time we did a good deal of the research for you already. 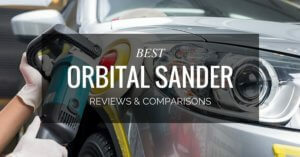 All you have to do now is review our findings and then select the model that will best meet your needs. The specs for this state it provides powerful torch, with 2 x the power in its 110 volts, 1 amp single-phase motor. Consumer reviews were very positive about this feature. Many stated it did not get bogged down during filleting nor got excessively hot in the hand when running for a long time. From crappie to walleye and everything in between this knife has power to last. 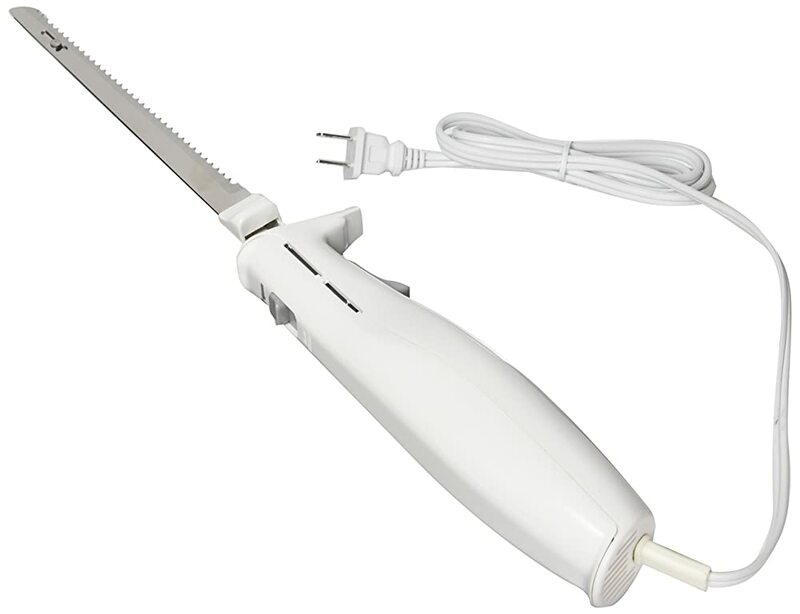 This electric knife requires it to be plugged into a standard household outlet during use, however, it has a good long cord so cutting things on the kitchen counter, or island, providing little chance of accidentally becoming unplugged or knocking other items over. The Rapala is 110 volt which is advertised as having double the speed and 3 times the power of other fillet knives. This makes it superior for cutting through rib bones, back bones, and numerous types of fish. 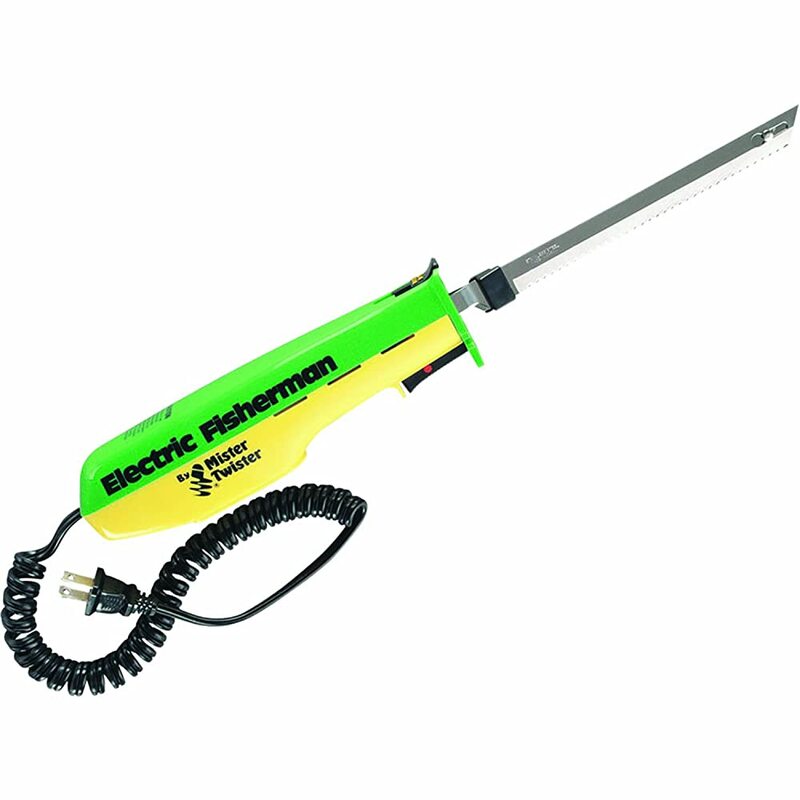 This 120-volt knife comes with 1 long blade which makes quick and clean work on a loaf of bread. The easy release switch makes cleaning and replacing the blade a snap. This kitchen knife operates on standard household kitchen outlet providing more than enough power to cut through meat and bread with ease. The warranty on the knife you choose may make a difference for you depending on the amount of cutting, and the types of food (or other items) you will be carving. Most warranties are for manufacturing defects only so keep this in mind when making your selection as well. Depending on what you plan on using your electric knife for, the issue of portability may be a huge deciding factor on which knife you choose. This knife has proven very popular with people who catch, and eat a lot of fish. It comes with a carry bag, which is convenient in helping to control odor during transportation in small enclosed area, like your car. Its weight of just 2.1 pounds also adds to its ease of transport. 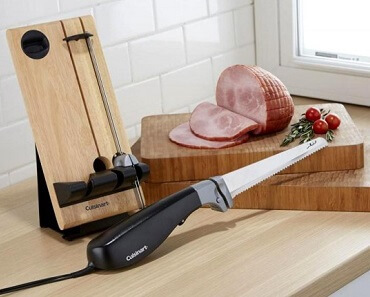 This Cuisinart knife comes with a 4-foot cord allowing for good flexibility in kitchens with smaller work areas; and even smaller access to power outlets. It also comes with 2 blades, one for meat, and one for bread. It stores very nicely on a butcher block style frame, where you can lock in the blades, providing a safe, and space saving, storage option. The overall weight of this knife is just 2 pounds. It comes with 2 blades but does not have a carry case or display case. Still, it will easily store in your knife drawer. At only 1.4 pounds this knife can easily be used anywhere, by just about anyone. It has a shorter cord than some other knives but most customers agree they can work around this issue. This knife has a nice long straight design handle and weighs only 1.5 pounds. 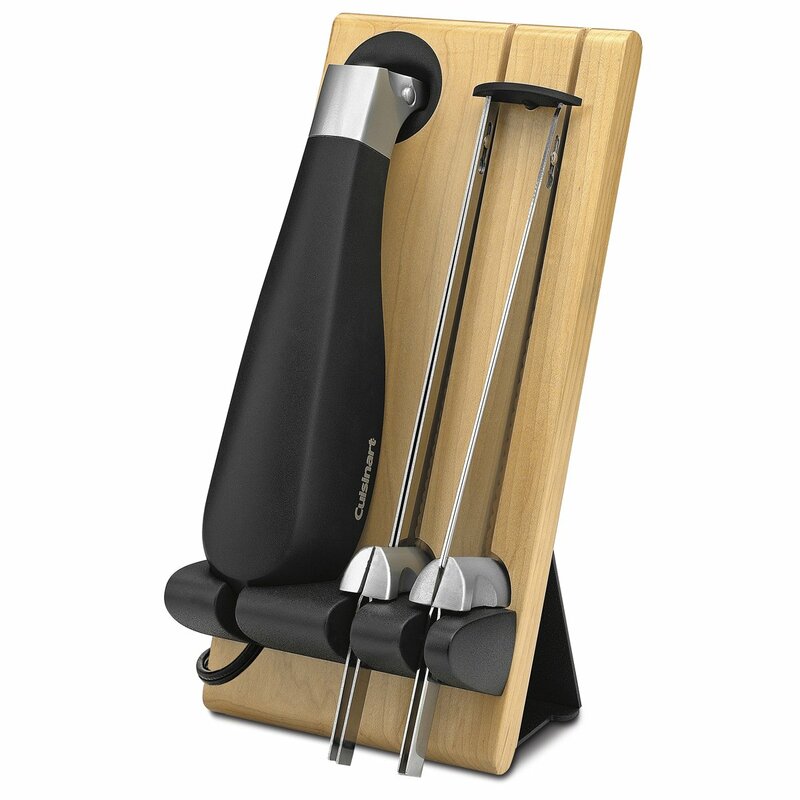 It comes in a convenient carry case that holds knife handle, blade, and the carving fork. This makes it easy to take it on the road and help mom and dad carve their own turkey at Christmas. If you prepare and cook fish in a restaurant then the durability of this knife may be exactly what you need. There were many consumers who rated this knife high because of its stamina. Again, many consumers who left reviews were happy that this knife didn’t seem to want to quit, no matter how long, or heavy the workload. The ergonometric designed handle is also great to help keep the user from getting cramped up. More than one consumer figured the knife was so good it was making them look good when it came to filleting. That is what good quality blades can do for you. The ergonomic design of the handle makes this electric kitchen knife easy to use, whether you are left or right handed. The two blades are easily interchangeable and they are dishwasher safe. The bread knife makes nice clean cuts and seems particularly suited to crusty loaves. The butcher block holding tray helps make this elegant designed knife look like a piece of kitchen artwork. Easy and safe to store, always ready when you need a hand with dinner or at snack time. Again, this is a nice shaped knife, having curved finger grips on its underside for a nice comfortable hold. Consumer reviews state that this model lasts well, holding up just as long as the person using it. The knife has been described as a “little monster”, and “it may actually work too well”. It has the unwavering ability to slice cleanly through any roast, turkey, or ham. The long, thin blade on Mister Twister makes carving turkeys, ham, chicken bones, and even Styrofoam a breeze. The 7 ½ inch blade make carving meats and breads super easy. It cleans up easily then stores away in the drawer in its case until the next time you need it. You have been presented with a lot of information so far regarding each knife, and certainly, each has good points, and bad points. Below we have tried to summarize the main points in an effort to help you make your final purchase decision. This knife is by far the most expensive of the 5 contenders but it also holds the best overall rating, according to the consumer reviews. Most people who used this knife needed it to fillet large amounts of fish. It’s stamina and power satisfied most users, with just a few commenting that the trigger would occasionally stick. Portability was also a strong point for getting this knife a good rating, along with having one of the best warranties. This is a mid-range priced knife which can be used in the home for carving anything from meat to bread. Though it needs to be plugged into a power outlet for use the length of its cord helps to make it much more flexible and usable in the kitchen. Even with having one of the lower ratings the basic feedback from customers regarding the knife’s quality and dependability is positive. This model also has the longest warranty of all the selections. This is also a fairly expensive model, and has one of the lower consumer review ratings. Yet it performs well enough in the kitchen. It is one of the heavier designs but has finger grip indents that help create a more comfortable hold. The blades for this model can be washed in the dishwasher, which is not the case for many models of electric knives. This model of knife is tied for first place in the consumer report ratings. As one of the lowest priced knives, it is also one of the lightest in weight. The cord design on this might reduce its portability factor, but most consumers are still happy with its performance overall. This model of knife is great for carving up the seasonal turkey or the fresh homemade loaf of bread. It is the second lightest in weight, and the lightest in price, and the lowest consumer satisfaction rating. But that does not make it a bad purchase. 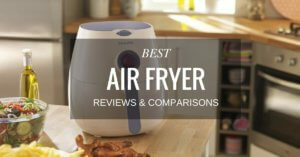 It simply means that it may not be as versatile in uses as some of the other models. So now that you have been presented with all the necessary facts which is the best choice for your money? 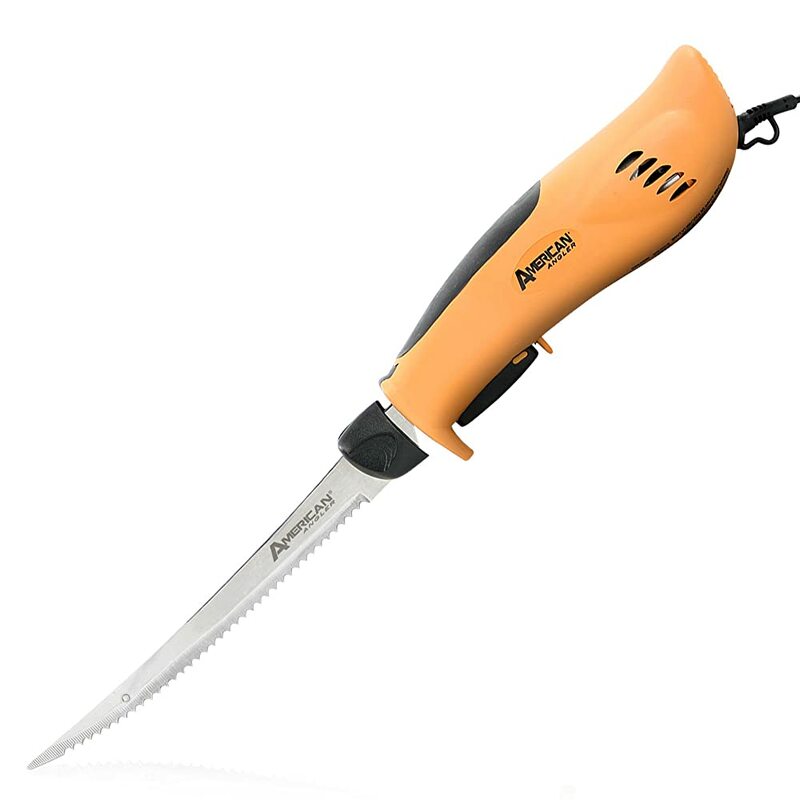 The top rated electric knife according to consumers, and our first choice, would be the American Angler Pro Electric Fillet Knife. It is the more expensive model but if you are going to be using the knife fairly often it has the best-staying power, it’s portable, and will definitely be a good investment in the long run. The next best, and more affordable option, has got to be the Mister Twister. This knife has a good overall consumer rating, a decent price, a 2-year warranty, and the slim design makes it a knife that will fit most hand sizes comfortably. So there you have it. 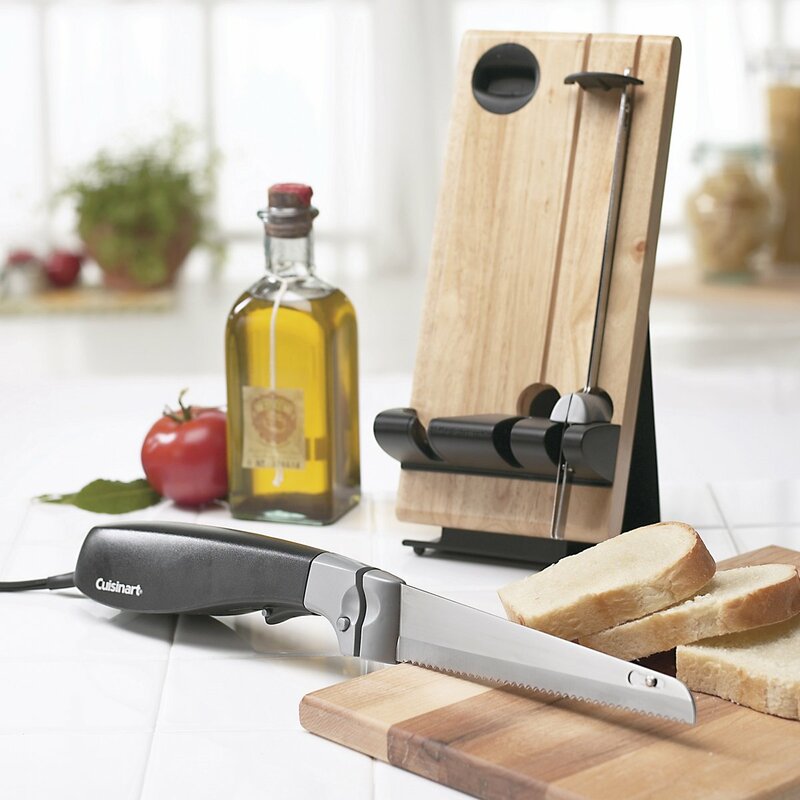 Each of these five electric knives are what we consider to be the best on the market today. The final decision to buy is up to you of course, dependent upon your needs, and your financial situation. But just remember, every good cook, and aspiring cook, needs to have a kitchen equipped with the proper tools and having the best electric knife is a must. Once you have used an electric knife you will wonder why you never tried it sooner, and you will never look back. Happy carving.